I have recently realised that a lot of my parenting philosophies can be synthesised down into a few short phrases or even words. The phrases have changed with the years (I don’t seem to be screaming a simple “Stop!” that often anymore). Some phrases, I am sure, have been used since the dawn of time. Very likely even cavemen (and woman) told their kids to “think before you speak”! I have been hearing myself saying “Read the Room” a lot lately, especially to my pre-teen. I think it such an important thing to do and an important life skill to have. To be aware of the mood in the room, to be aware of the people in the room and their humour, customs and age. The ability to be conscious and emphatic of our environment is something that we as adults take for granted, though even we often manage to misjudge situations. Now that my kids are getting older and spending more time with their friends’ families and even our family without me being around, I want to make sure that they know when it is the right moment to tell a fart joke (possibly not in front of an 80-year-old grandmother) and when it is the right time to listen to someone else talking and to ask the right questions. They are around much more adult conversations and do need to be able to judge what is the right thing to say, I feel. Now just to be clear — this does not work all the time and let me tell you, the room often is mis-read. ; ) As usual rearing kids is often a work in progress! 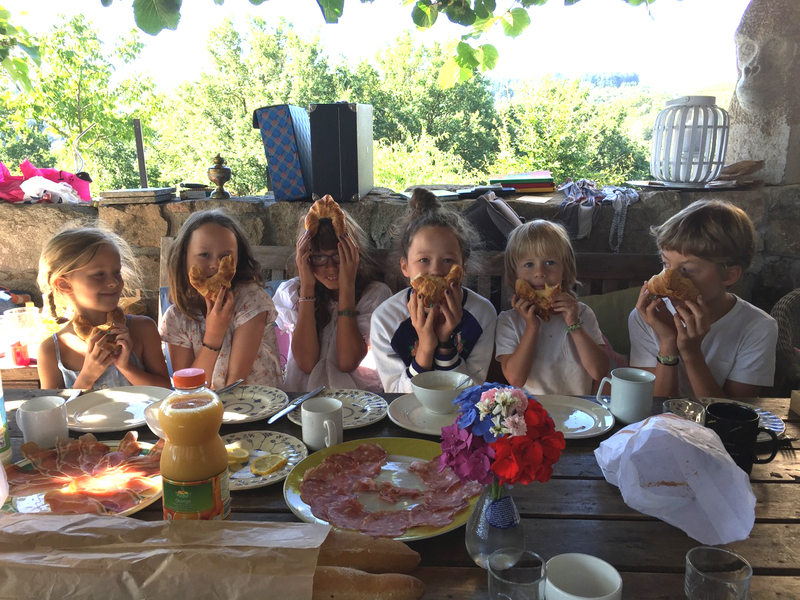 Above is a photo of Esther’s and my kids last summer when they all “read the room” and realised it was totally ok to play with their food as their mamas were taking photos of them! I was just about to say the same as Phoebe! I think it’s such a great phrase to use for children (and adults). I really admire the way you bring up your two girls Emilie. Getting to know your baby. Did you know your newborn immediately? Do you find out your baby's gender? Do you let your kids walk to school? The birthday hangover -- is it a thing? What time do your children go to bed? And you? ?